It is important that the panellists understand the difference between the tastes and are using a common language to describe aromas and mouthfeel sensations in chocolate. 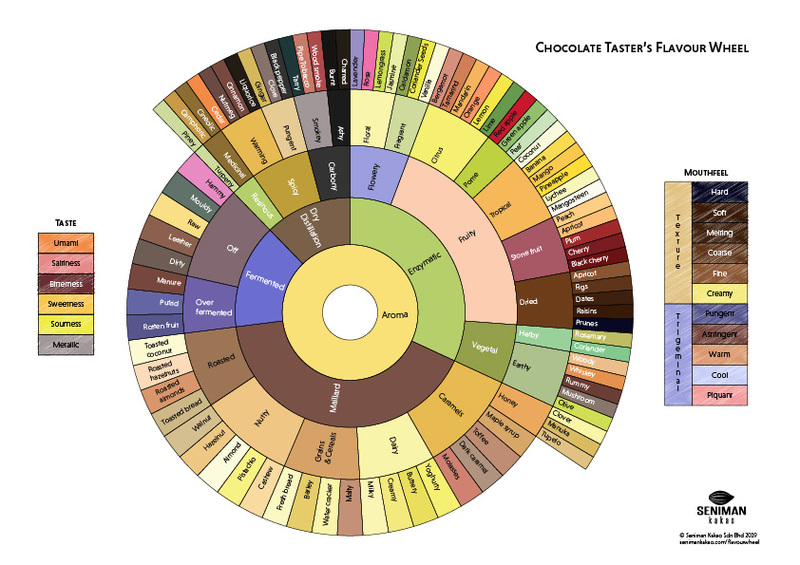 The flavour wheel gives us the vocabulary to describe a wide range of chocolate with tastes, aromas, and mouthfeel typical in chocolate, including off flavours. The flavour wheel can simply be used to jog your memory when the flavour that you’re trying to describe is on the tip of your tongue or the end of your nasal cavity. What’s important is that you rate your overall satisfaction with the chocolate and perhaps note down a few obvious flavours. Tastes are sweet, sour, salty, bitter, umami, and metallic. They are sensed by our tastebuds in our mouths, our tonsils, soft palate, and we even have tastebuds in our gut. We sense taste variably across our entire tongue, and the regions where we sense taste may change over time. We also culture different bacteria that inform our sense of taste, which, depending on the food that we eat, also change what we perceive as taste. Aromas are difficult to calibrate for without aroma kits and we generally rely on the panellist’s experience with food and drink. To help tasters retrieve descriptors from the tip of their tongue, the flavour wheel divides aromas into the reactions that created them: enzymatic - fruity, vegetal, flowery; fermentation - off flavours, overfermented, Maillard - caramels, dairy, grains and cereals, nutty, roasted; and dry distillation - resinous, spicy, carbony. Respectfully, the aromas from the plant, the fermentation reactions, the light roasting reactions, and dark roasting reactions. Don’t forget to breathe out through your nose while tasting for aromas. Most of the aroma sensory apparatus hides in our nasal passage, as anyone with a cold will attest. Mouthfeel is the sensations we experience in the mouth while tasting chocolate. It covers the feeling of the chocolate with the first bite, during the tasting, when the chocolate is melting in your mouth, and after swallowing the chocolate.